Medical education is in the news for all the wrong reasons. The government's decision to extend reservations in institutions of higher education under the Centre triggered off a storm of protest, led by medical students. What has been lost in the heat and dust of the protests are fundamental issues. Is privatisation of medical education hurting the capacity of the system to deliver quality care to the majority of people? Is the quality of education good enough? And, of course, why is the state health education sector on the brink of collapse? That India is short of doctors and paramedical staff in absolute terms is hardly news. But behind bare statistics is another story. There is a big skew in the distribution of health care personnel -- for instance over rural and urban areas. And, equally important, there are serious questions about the training doctors receive in terms of its utility for different categories of diseases and, therefore, delivery to different categories of people. Let's take a look at the big picture in terms of numbers. who's World Health Report for 2006 shows there is a global shortage of health professionals. The greatest shortfall occurs in south and southeast Asia. India, Bangladesh, and Indonesia top the list. The number of registered doctors in India has increased from 61,800 in 1951 to about 645,825 in 2005 -- that's 0.60 doctors for 1,000 people. Compared to this, Cuba had 5.91 doctors for 1,000 people in 2002. The Joint Learning Initiative, a global health network launched by the Rockefeller Foundation suggests that, on an average, countries with fewer than 2.5 health care professionals (doctors, nurses and midwives) per 1,000 population fail to achieve an 80 per cent coverage rate for deliveries by skilled attendants or for measles immunisation. India has 5.9 doctors, 0.8 nurses and 0.47 midwives for 1,000 people, which adds up to 1.86 health workers for 1,000 people. Apart from the fact that this figure falls considerably short of the desired figure, it also does not indicate the distribution of health professionals and does not, therefore, show how supply relates to demand. The statistics for the state sector reveals a pathetic scenario. According to the Union ministry of health and family welfare's (mohfw's) Health Information of India , 2004, the the country had 67,576 government doctors: meaning one doctor was serving roughly 15,980 people. The current availability of doctors does not meet the recommendations of several past committees. 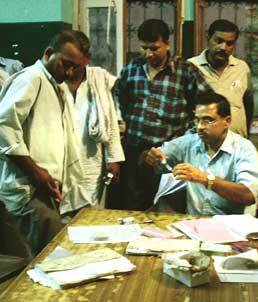 In 1946, a committee headed by Joseph Bhore, an Indian Civil Service officer, had suggested one doctor for 1,600 people; another committee in 1948 had recommended one doctor for 1,000; and an Indian Council of Medical Research-Indian Council for Social Science Research joint panel had recommended in 1980 that six general practitioners and three specialists should be available for 100,000 people. As far as specialists are concerned, the situation on the ground comes nowhere near meeting this figure. The government's estimated requirement of specialist surgeons, obstetricians and gynaecologists, physicians and paediatricians in 2001 for community health centres in rural areas is 12,172, but only 6,617 positions have been sanctioned and 4,124 positions have been filled. An Escorts Heart Institute and Research Centre document prepared in 2005 said India would need at least one million more qualified nurses and 500,000 more doctors by 2012. If one looks at the distribution angle, the situation is worse. The World Health Report for 2005 showed that one doctor might be responsible for more than 200,000 people in some rural areas. The urban-rural skew is well illustrated by Chandigarh, a predominantly urban area, where one government doctor is available for just 654 people, which is the best figure in the country. The striking feature of this statistic is that there is no necessary statewise correlation between the number of medical colleges and the availability of doctors. 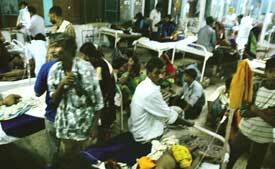 Maharashtra, which has the highest number of medical colleges, one government doctor services 20,010 people. 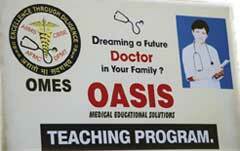 In Andhra Pradesh, which has the second highest number of colleges, there is one government doctor for 13,468 people. Unsurprisingly, both these states have a large number of private medical colleges, which typically do not send doctors to the state health sector (see table: Private matters; see graph :Growing pains). The growth of the private medical sector is bleeding public institutions. The All India Institute of Medical Sciences (aiims) has been nominated as the top medical college in the country in 2006 by an India Today-AC Nielsen- org - marg survey. But even aiims is facing a shortage of manpower. The minister of state for health and family welfare, Panabaka Lakshmi, told the Rajya Sabha on May 12, 2006, that the college had 479 faculty members against a sanctioned strength of 543. During 2003-2005, 20 faculty members either resigned or took voluntary retirement. In 2006, V S Mehta, head of neurosurgery, Anoop Misra, professor of medicine, and S N Mehta, head of surgery, have joined private hospitals. Lakshmi said this level of attrition was normal at a centre of excellence. Clearly, if aiims cannot hold on to faculty members, it is unlikely other institutions, especially those in smaller centres will be able to do so. This is, in fact the case, with grievous repercussions. In view of the shortage of doctors in the state sector, there is an obvious need for a revamp of the medical education sector to redress the balance between private and public medical colleges, to meet the needs of public health. At present, private colleges, which number about half the number of medical colleges, reserve some seats at subsidised tuition fees. But the number is small, which puts a big strain on government colleges, given the limited public funding on medical education. Public debates, unfortunately, miss the big issues. The anti-reservation agitation sparked off by Union human resources development minister Arjun Singh's announcement of an increase in reservations in institutions of higher education, including medical colleges, highlighted several issues. If some of these have to do with the overall availability of seats in medical colleges -- and thus chances -- some have to do with questions of social justice and creating a health system that is responsive to the majority rather than a small elite. Numbers have been crunched since Singh made his proposals public -- the responsibility for taking the matter forward now lies with a committee headed by Congress leader Veerappa Moily after the Supreme Court's intervention. But crunching numbers can be a perilous exercise. The Health Survey and Planning Committee of 1961, for instance, had recommended that one medical college should be available for five million people. This amounts to 200 colleges, given the country's roughly 1 billion population, with adjustments for the average number of seats in colleges. By this reckoning we have made the grade. But, as we have said earlier, to meet the health care requirements of the country there has to be a balance between doctors available for the state sector and those either going into private sector or going abroad. This depends partly on the balance between private colleges and government colleges, because getting students from the private sector into the state health sector, especially rural areas is tough. Data from the Medical Council of India (mci) website, as of June 7, 2006, shows that 119 out of 243 colleges are private. Also, the proportion of private seats rose from 6.8 per cent in 1960 to 40.9 per cent in 2003. The comparative economics of private and public health education makes it clear why students of private colleges don't go to the state sector -- though the caveat that state-educated doctors don't necessarily go there either has to be kept in mind. In private health colleges, a bulk of admissions is based on donations -- or capitation fees as they are called. The Centre, in a reply to parliament in 2002, said the cost of imparting medical education was Rs 3.15 lakh per student annually. Government colleges pay a huge subsidy. Maulana Azad Medical College in Delhi, a government college, for instance, charges around Rs 15,000 as compared to the Rs 36 lakh charged by a private college like Santosh Medical College in Ghaziabad (see box: Malpractice). Rules had been set down by mci in 1997 (for three years) to reduce these wide variations. Private colleges could charge upto Rs 1.10 lakh per student a year, with students getting scholarships paying Rs 13,000 per annum. In 2000, they hiked this by 15 per cent for the next three years. After this, no revision was made. Not surprisingly. A paper published by the Center for International Development at Harvard University, usa, on higher education reforms in India in 2004 documented the increased involvement of politicians in the lucrative business of health education, because politicians found it easy to get institutes recognised by mci and swing the necessary procedures for getting non-profit status and benefits like tax exemptions and free land. Even though private medical education was increasing, under pressure from several quarters, the government had to ensure that medical education did not get limited just to those who could pay. The Centre set down some ground rules: 50 per cent of seats of a private institute would have to be filled through a state-level exam and the fee structure for these seats would be the same as that of a government college. But this kind of control has not been possible in most cases. In 2002, the Kerala government decided to promote the private sector, but within a strict regulatory regime. The government fixed a maximum of Rs 28,750 as annual fees per student and said 50 per cent of students admitted in private colleges should be from a merit list prepared by the government. But after the state government issued the order fixing admission and payment of fees in unaided medical colleges, two colleges appealed in the high court against this order. The court cited a Supreme Court verdict of the same year, in the case of T M A Pai Foundation and others versus the State of Karnataka and others, and ruled that the government order was "arbitrary" and "illegal". It reduced the number of merit seats and increased the fees for them to Rs.1.5 lakh a year on the basis of the government's submission regarding the likely expense that it would incur for a medical student's education. The question of the government's role in regulating private medical colleges has been embroiled with the reservation issue even before the latest controversies, especially in states that have aggressive reservation policies with a large number of private colleges. Private players argue that reservations can apply only to the seats on the government's merit list. Litigation has been extensive, with three cases being significant and a lot back and forth movement creating its own share of confusion. On August 12, 2005, the Supreme Court delivered a unanimous judgement in the case of P A Inamdar and others versus the State of Maharashtra and others, saying that the state could not impose its reservation policy on unaided private colleges, including professional colleges. The court held that enforcing the reservation policy of the state on unaided professional institutions constituted a serious encroachment on their rights and autonomy. It also said that merely because the state's resources in providing professional education were limited, it couldn't force private educational institutions to make admissions on the basis of its reservation policy. Private players echoed this view saying the government could fulfil its responsibilities by enforcing quotas on the seats it regulated in private colleges. This argument, of course, begs the question of how wide the government's powers of enforcing a merit list and fixing fees should be. The Inamdar judgement was an attempt to bring clarity to two previous judgements by the Supreme Court. One of them was the judgement delivered on October 31, 2002, in the Pai case (the Pai foundation runs the Manipal Academy of Higher Education), which set down the precedent on how seats would be divided between the merit and management students. The court suggested that a certain percentage of the seats could be reserved for the management from among students who had passed a common entrance test held by itself or by the relevant state/university, while the rest of the seats could be filled on the basis of counselling by the state. The other judgement delivered on August 14, 2003, was in the case of the Islamic Academy of Education and another versus the State of Karnataka and others. The Supreme Court interpreted the Pai judgment and said unaided professional institutions were entitled to autonomy but at the same time they would have to take into account the criterion of merit as specified by the government. Secondly, it upheld the earlier ruling on reservation of seats for management filling seats on the basis of counselling by the state agency. The court also suggested that unaided professional colleges should also make provisions for students from poorer and backward sections of society. But not all state governments were willing to abandon reservations. The Maharashtra government decided to restore reservations for scheduled castes, scheduled tribes and other backward castes in vocational courses run by private educational institutions in the state in May 2006, after a forceful appeal by Union agriculture minister Sharad Pawar. The government will determine admissions for the academic year 2006-2007 in these institutions. A total of 2,210 seats are available in Maharashtra. While 15 per cent of the seats will be filled under non-resident and other quotas, 10 per cent will be filled through an all-India entrance examination. Of the remaining 75 per cent seats, 50 per cent will be reserved for the scheduled tribes, castes and other backward castes. With the reservation issue hanging fire, a contentious bill pending with the government on distribution of seats between government and management might now have to be re-thought. The fate of the controversial Private Professional Educational Institutions (Regulation of Admission and Fixation of Fee) Bill, 2005, which proposes a division of seats that is largely in favour of private colleges is uncertain, given the reservation debate. What is certain, however, is that the debate risks getting lost in a morass of detail about percentages, jurisdictions and, with the latest anti-reservation twist, passion and prejudice. What is being lost sight of is the fundamental issue: delivery of quality health care to the people. The Harvard University paper mentioned above makes an important point. On the one hand, the state sector has been on the point of collapse for some time now both in the areas of health education and health care. This has facilitated the growth of the private sector, which the state is trying to regulate, or, indeed, control, with mixed results. The casualty is public health. An examination of issues relating to quality will make this obvious. MCI is the body that is supposed to monitor and enforce standards of medical education in both the private and state sector. mci, a statutory body under the mohfw , was established under the provisions of the Indian Medical Council (imc) Act, 1933. Under constitutional provisions, higher technical education was a state subject. In 1992, it was transferred under the control of the Centre and the imc Act was amended to give extensive powers to mci. This created many controversies. mci used its powers to issue orders directly to state governments by-passing the Centre, which argued that it was blocking public-private partnerships and private initiatives. Rules mandating new medical colleges had to have around 10 hectares of land and their own hospitals were prohibitory to growth, it was argued. In 2001, the Planning Commission issued a report of the Working Group in Development of Human Resources for Health suggesting that mci's regulations be reviewed, with regard to opening new medical colleges and courses. It wanted more encouragement for private colleges in remote areas. In 2005, a bill to amend the imc Act was approved by a group of ministers and sent to the Union cabinet. It asked for an increased role of mohfw, with government nominees placed in mci. It was argued that such nominees would have no vested interests and be better placed in improving transparency and accountability in running health education. It was also suggested that since the people controlling mci did not have much administrative experience, the induction of the director-general health services would lend teeth to the body. This move was widely opposed by the medical fraternity, with its representative organisation, the Indian Medical Association (ima), saying this would lead to arbitrary government action. It cited the instance of the National Democratic Alliance government (1999-2004) approving admissions in medical colleges despite mci 's objections. The Supreme Court reprimanded the government, saying mci's permission was necessary. But the controversy over jurisdiction continues. mci is supposed to carry out physical verification of medical colleges and not quality assessments. It is also supposed to regulate and update the curriculum. As of now, though equal weight is given to all subjects on paper, lesser time is given to preventive and social medicine. The council recommended medical education units in all medical colleges in 1981 and 1992. A parliamentary committee on subordinate legislation also strongly recommended that mci should make it compulsory for all medical colleges to prescribe a minimum number of lectures to be imparted using audio-visual techniques. Kusum Verma, former head, department of pathology, aiims, adds that under mci regulation, it is mandatory for colleges to have an education unit, which should carry out faculty development exercises. In aiims, she says , they have made a difference. C Sathyamala, a community health expert, also points out that the curriculum set out by mci does not allow for contact between medical students and patients in the early years and desensitises prospective doctors from the needs of patients. mci also has the responsibility of ensuring that medical colleges meet minimum standards. But some private colleges complain that mci's inspections are arbitrary in most cases. A doctor who shifted from a public college to a private one says mci never bothers to carry out the inspections in public colleges but insisted in testing each and every instrument in a private college. The government, on the other hand, accuses mci of corruption and inefficiency. Before it drafted the 2005 amendment Bill, it constituted a task force to look into the mci's workings. The task force claimed it had found gross irregularities in its functioning and recommended that the government takes control. There are numerous instances of mci failing in its regulatory functions. In Andhra Pradesh, it was alleged that in 1998-1999 the state government covered up a staff shortage in some of its medical colleges with the help from the Andhra Pradesh Government Doctors' Association to get permission from mci for more mbbs and postgraduate seats. The association's office-bearers inadvertently revealed that it was "cooperating" with the government. Similar situations have been encountered in other parts of the country. In December 2003, journalists found that Bharati Vidyapeeth Deemed University's medical college in Pune had hired doctors to play faculty during an mci inspection. mci did not find anything wrong with the institute but a high-level probe into the working of private medical colleges in Maharashtra, ordered by state governor Mohammed Fazal, found serious lapses. The probe had been conducted to identify problems in fee structures and inadequacy of facilities. The probe, conducted by the Medical Education and Drugs Department, found that of the 17 private mbbs colleges inspected, only one met mci norms. Three colleges had a 50 per cent shortage in the professor cadre, while four colleges had a shortage of more than a 50 per cent deficit in the professor cadre. Four colleges had a shortage of more than 50 per cent in the associate professor cadre. Bharati Vidyapeeth was also listed for insufficient teaching and non-teaching staff, inadequate infrastructure in some departments, and fewer patients than mandated in the hospital. An inspection carried out in 2004 by the Maharashtra state government's medical education and drugs department showed that private colleges in the state did not meet the criteria set down by mci. Its report showed that of the 17 medical colleges in the state, nine were short-staffed by between 50 per cent and 63 per cent. "Most of the faculties shown by the colleges are working on a part-time basis on monthly salaries as low as Rs 2,000," says the report. It also points out that it is surprising that in spite of such clear shortages, mci has recognised the colleges. However, Davinder Kumar, deputy secretary, mci, says it gets 30-35 applications for new colleges a year, but approves a fraction. Behind the tussle lie conflicting visions. Saurabh Goyal, a graduate from the privately-run M S Ramaiah College, Bangalore, says private college are better because their courses are well-planned and the faculty pays more attention to students. Private institutes, he says, upgrade systems, which, government colleges don't. Proponents of public colleges say infrastructure in private colleges is useless as there are very few patients to observe there. This is true, observers say, because most students from private colleges gain experience by taking residencies in public hospitals. Doctors teaching in public colleges are not allowed to practise unlike their counterparts in private colleges. This, they say, makes for teaching of better quality. Verma says it is not right to generalise about the respective merits of private and state medical education, though she admits that students in public colleges have the opportunity to pick up more practical skills, which is essential. Whatever the disagreements about the respective roles of the public and private sector in providing medical education, it is clear that the way the system works at present does not help address the health care needs of the majority of the people. This point is important: blaming individual doctors for not performing social service is pointless. The system hasdisincentives for participation in public health activity. Qualified doctors don't want to work in rural phcs where they would also have to discharge non-medical functions. Then there is the problem of shortage of medicine and equipment, and other elements of infrastructure. There are rules about compulsory service in rural areas, though they differ from state to state. Medical students are supposed to sign a bond saying they will work in villages for a stipulated period. But in most cases, states are unable to provide jobs. Vacancies are often not filled because governments do not have the money to pay salaries. "There were quite a few of us who wanted to serve in the rural areas in Madhya Pradesh after graduating but the government freed us from the bond saying that they did not have any positions," says Jacob Puliyel, a paediatrician at St Stephen's Hospital, Delhi, who graduated from the Netaji Subash Chandra Bose Medical College, Jabalpur. Ajay Gambhir, honorary secretary, ima, who studied at the Mahatma Gandhi Institute of Medical Sciences, Wardha, Maharashtra, faced exactly the same problem. The national health policy also suggests that a two-year rural posting should be enforced before awarding the graduate degree, but the idea remains strictly on paper. "Before getting their degree in hand, doctors should be made to work for three years in rural areas, this way they will pay for their subsidised education. They should get a certificate from the community to show that they have really worked," Sathyamala says. State governments, however, say they have tried to give incentives to doctors -- postings of choice and sponsorship for higher education after a period of service -- and disincentives including fines against bonds if rural service contracts are not honoured, salary docking and department action. None of these seem to have worked, however. As a result, private health professionals provide 80 per cent of health care in the country. The increasing privatisation of medical services makes it even more difficult to force doctors to work in rural areas, because it is changing the expectations of returns. "Doctors are not willing to work in rural areas because infrastructure is not put in place. Even if the doctor has to work only for a year there, circumstances should be comfortable," says A K Agarwal, dean, Maulana Azad Medical College, Delhi. "All our mbbs students prepare for admission to post-graduate studies and 30-40 per cent of these try to go to the us." Very few try to enter government service at this juncture and even if they do clear the exam, which would send them to rural areas, no one goes, he adds. "These student use social capital, get trained on the poor and open businesses like medical tourism, which caters to people outside the country. People have the right to ask doctors what they are getting in return," says Abhay Bang, director of the Society for Education, Action and Research in Community Health, an ngo based in Gadchiroli district of Maharashtra. Providing basic facilities seems to be the obvious solution. But the Centre and state governments can't seem to do that because funding for health services is minimal -- 0.9 per cent of gdp in 2005. Funds provided by agencies like the World Bank are also not directed at public health infrastructure. For example, in 1993, the World Bank and International Monetary Fund had suggested that structural changes should be made in the field of health and there was a need to be selective in the areas where funds are utilised. Public health was not prioritised and rural areas continued to suffer. Preventive medicine has also been a major casualty. "Students go in for medical education with a dream of making money," says Bang. This causes a shift from public health to market-driven medicine. There is a skewed distribution of specialisations, with a shortage of trained public health professionals. Seventy per cent of the people in the country suffer from common diseases like diarrhoea and anaemia but doctors are trained in treating a small spectrum of diseases like cancer and heart diseases, he adds. Public health is taught in medical colleges as part of the syllabus for mbbs and postgraduate courses. mbbs courses try to ensure that students get exposed to rural training during internship as part of the preventive and social medicine syllabus, but few people take this seriously. Later, those who do not get admission in other postgraduate courses usually opt for this specialisation. Undergraduates who are trained in public health go to rural training centres affiliated to phcs in relatively well-connected rural areas that are better equipped than the average phc . As a result, they are not exposed to most rural real-life situations. Amit Sen Gupta of the Centre for Technology and Development says there is no shortage of doctors in the country, the problem is in how they are deployed. Doctors are trained to work in institutional settings -- with a certain kind of infrastructure and diagnostic facilities. These doctors are not able to deliver in rural areas. Training for rural areas is not taken seriously -- students take it as a picnic. They are not equipped to handle rural areas, especially because they don't have support systems. It is a waste of money training doctors for five years and sending them to rural areas, Sen Gupta says. Better-trained auxiliary nurses and midwives, and health workers would be a better option. The government echoes this, saying the lack of public health professionals puts a burden on medical doctors, who are trained as clinical care providers (see box: Only schemes). It has, therefore, decided to support the Public Health Foundation of India (phfi) in collaboration with Harvard School of Public Health (hsps). Prime minister Manmohan Singh and the Union health minister launched phfi on March 28, 2006. "The Planning Commission has been asked to make an assessment of the scenario of human resources for health. This is important to address the wide inequalities in the provision of services within India. While states like Kerala, Tamil Nadu and Gujarat may have acceptable standards, there are several states ... which do not have even the minimum number of institutions to turn out support staff for health care. There are also serious lacunae in the capacity of the health sector to absorb and optimally utilise extra financial resources, " Singh said . hsps has collaborated with the Indian government, the Bill and Melinda Gates Foundation and other public and private partners to form phfi. Work will be initiated by 2008. phfi aims to influence public health education, research, and policy. It will bolster existing schools of public health by creating a pool of permanent faculty and establishing an accreditation agency that will standardise public health education. The us's Association of Schools of Public Health will offer assistance. India currently produces some 375 students each year from its 95 schools of public health and institutions -- compared to the 10,000 needed annually. The foundation "seeks to bridge a very major gap in our health education by training professionals in disciplines that relate to health, such as economics, sociology, demography and environment -- in addition to management of diseases", Singh says. Business groups and individuals are joining hands with the government to set up public health schools. The first of these is likely to be set up in the national capital region. Harpal Singh, a member of the governing body of phfi and chairman of Fortis Healthcare, says it will be set up with a corpus of over Rs 100 crore. Most countries, especially developing ones, are focussing their energies on issues of manpower and health care delivery in who's year dedicated to increasing health workforce. It's unfortunate that in India public debate has been embroiled in the reservation issue to the detriment of basic questions of public health. The authorities are stuck in the same morass.